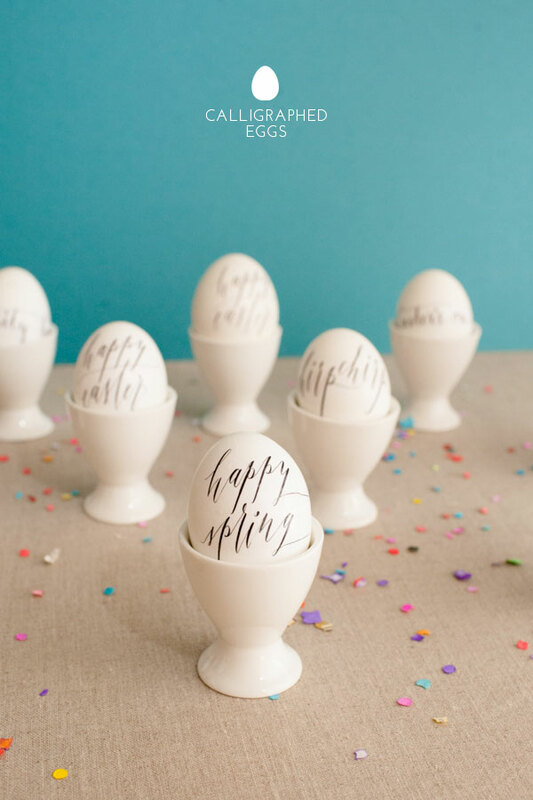 I love the idea of decorating simple and beautiful eggs through calligraphy. But let’s be honest, it’s difficult to write in a pretty font on a rounded surface. So, this year we had Julie Manwaring make us some templates to apply using tattoo paper. They were easy to make and even easier to clean up. Now, that’s a project I can get behind. 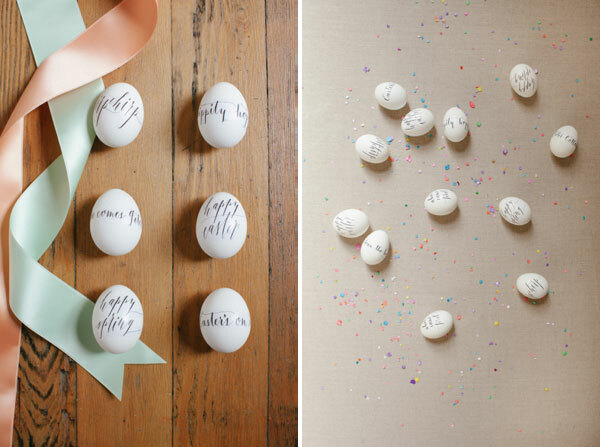 PS – Remember this fun confetti egg game ? I’m hoping we play again this year! Step 2: With the print out in hand, closely follow the instructions provided on the tattoo paper packaging for proper application of the adhesive sheet. Step 3: Cut out one tattoo, remove the clear plastic layer, and apply with a very wet paper towel to a hardboiled egg, again referencing the tattoo paper instructions for additional application details. 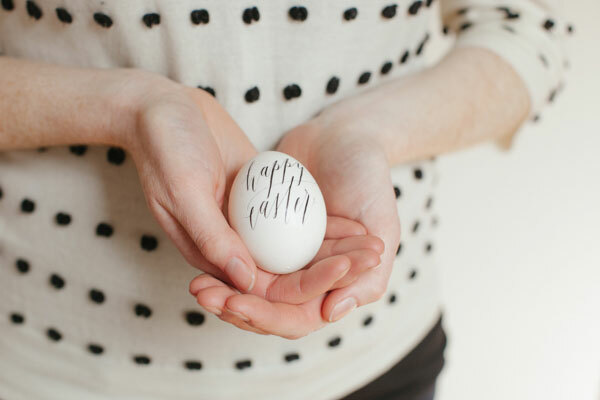 Step 4: Remove the paper backing and voila, a calligraphed egg! so clever, I love it. I could never really think of any ideas to use the tattoo paper for and this opens up a whole new world! Thanks for sharing. OH my Gosh! I love this! I’m a DIY-er but I like the things I make to look classy, not like something that my child’s 3rd grade elementary teacher assigned that only looks a little less sloppy because an adult created it. This looks classy. Thanks for the post if I find some time I’m totally going to make these! Has anyone been able to download the template? This is soo cool! 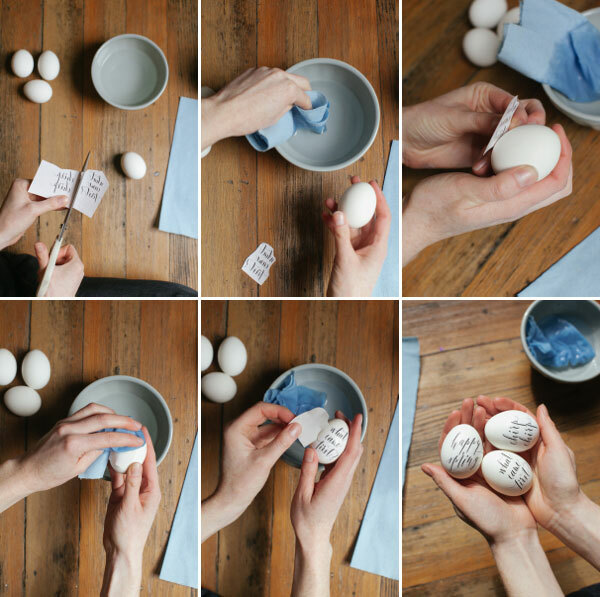 i’ve never heard of making your own temp tattoo and putting them on eggs just raises the bar for easter eggs! WOWOWOW! These are so lovely. These are my kind of Easter eggs. They are so beautiful. I can’t wait to make them!!! Wow, these are so delicate and sweet, great idea. It does seem the link to the download is not working. How fun!! 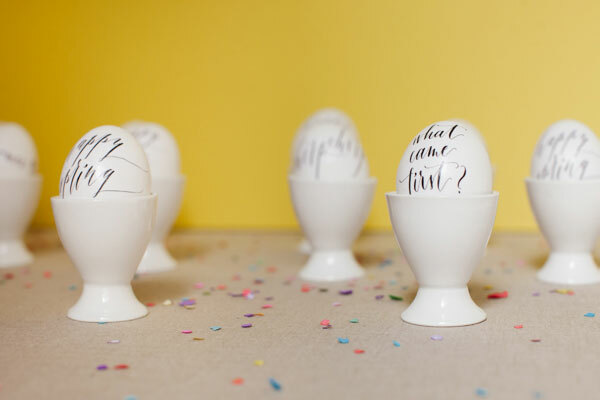 I can’t wait to be an Easter hostess one year so I can make a table setting with these adorable eggs!! Very pretty!! Great idea! I just was thinking what kind of decoration the eggs should have this year. Research completed. So so so so lovely! So simple, yet beautiful. Lovely handwriting is such an art form, especially these days. I adore this idea! What a beautiful end result! Oh, what a great idea! It’s so beautiful! Beautiful It’s raining today in Vancouver and we have Easter eggs on the brain, too. Wonderful post, as always. Beautiful, easy and creative You rock Jordan! Woah. These are amazing. One of my favorite Easter DIYs yet. the Peter Cottontail gif is awesome! The calligraphy is just gorgeous! It would be wonderful if there was a font that could provide a similiar look…. although nothing beats the hand lettering. Does anyone have suggestions for a downloadable font? I’ll be bookmarking Flourish and Whim. Thanks for sharing the project–great idea! Could you dye the eggs before or after this? The kid in me still really wants to see them dyed! So pretty! I need to learn how to do fancy calligraphy. So stylish and sweet – thanks for sharing this idea! soooo cute!! and that little gif at the end made me smile! I can’t download this with my existing programs. Is there something special that I need? Wow! You have always the best ideas! Does this also work on plastic eggs? LOVE THIS! So unique! Classy! So much fun, I can’t wait to give them a try. These look like so much fun! A lot easier than having to dye eggs!